This dialog window imports data from an Excel file. 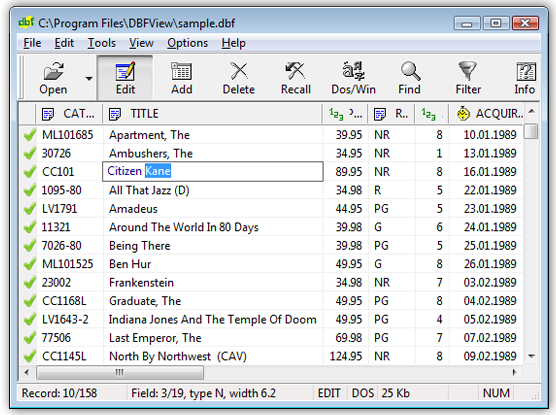 With "Import data into current (opened) database file" option, the DBFView will insert records from xls / xlsx file you selected into current dbf file. In this case the number of fields and field types should be the same as opened dbase file. If "Import data into another DBF file" is checked, the program will create a new dbf file based on selected Excel xls / xlsx file. - Empty names of the columns are not supported (columns laying to the left are only imported). - Columns names longer than 8 symbols are truncated up to 8 symbols. I found DBFView after a lengthy search on the net. I was looking for an interface that could provide a view, update, and edit interface for a large database that could reside on an internet drive (like X-Drive), where I and co-workers out of state could access and quickly update our numbers (basically job/data tracking for telecommuters). The company does photo-editing (school, corporate, restorative work) utilizing high-speed internet, waveform compression, and some good computer artists. Maybe 5000 negative scans per year. Anyway, nobody wanted to install full-blown database programs, sql server or the like, the company is not that big, nor is the data itself considered critical. So for this type of user, your interface provides clean, quick, simple, no syntax required, put the data in and go. Others I looked at tried to do the same but usually forget the "people element", and I don't have time to learn sql syntax and help them complete their programs. (Incidently, I used to have a lot of fun programming DBase II and III, then I saw Access and cried). I am doing support work in the field on a software system written with Visual FoxPro. Only the runtime is delivered to the end user. I have both Microsoft Access and Microsoft FoxPro on my system but when I am trouble shooting a site, I connect into their Lan with my laptop. It is time consuming to use these other programs to look at or modify .DBF files on the users system. To do this, I have to set up linkages from the IDE's for each file I want to look at. When I am done, I need to tear these linkages back down because they will no longer exist once I unplug my laptop from their network. I wanted a program that would allow me to quickly scan through a number of .DBF files and if needed make changes with a minimum of overhead work. I searched download.com for programs that would serve this purpose. Your program seemed to be a good fit. I downloaded it and a couple of others, worked with each and when I decided I would continue using yours, registered it. 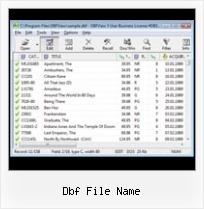 How to: Connect to a dBASE or Other DBF File Therefore the Database file name text box must contain the path of the folder where the DBF file resides, and must not include the file name itself. File Extension .DBF Details Program Name and MIME Type Info for File Extension .DBF FILExt has been given permission to display a Program Name/MIME type database collected by Anthony R. Nemmer. Convert DBF to XLS, DBF to Excel Saves the dbf database records a Microsoft Excel File xls. If "Export with field names" is checked, the the output xls file will contain field names.